Os Shushwap Natives o chamam de Salish N'ha-a-tik ou Na-ha-ha-itk ou long fish, depois o denominaram Ogopogo por causa do verso de uma antiga canção inglesa His mother was an insect, his father was a whale, a little bit of head and hardly any tail, and Ogopogo was his name. 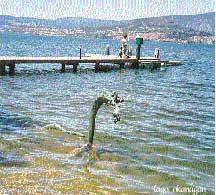 O Lake Okanagan, fica no Okanagan Valley, British Columbia, onde Ogopogo faz suas aparições, regularmente desde 1.872, e muitas pessoas que o viram o descrevem como uma criatura parecida com uma serpente. Já foi fotografado diversas vezes. Em novembro de 1.926, umas 50 pessoas que participavam de uma cerimônia de batismo viram o animal. Novas aparições do animal aconteceram no dias 2 de julho de 1.947 e 17 de julho de 1.959. O Fate Magazine, em agosto de 1.989, publicou notícia sobre esse animal. Em Powers Creek há uma pictografia do animal. Para os antigos Chinook , Ogopogo é uma entidade do mal. Tôdas as ocorrências sôbre o animal está no Kelowna Archives. Na busca incessante desse animal uma empresa ofereceu prêmio a quem provar a sua existência e mais recentemente a Okanagan University College Biology Department em Penticton e o Chamber and Rotary. Os criptozoologistas teorizam que deve ser um zeuglodon extinto há milhões de anos. Roy P. Mackal, criptozoologista, diante da descrição, acredita que deva ser uma baleia primitiva, o Basilosaurus cetoides, e o descreve em seu livro Searching for Hidden Animals. "The focus of the investigation turned to Summerland, and a particularly good vantage point was located at Peach Orchard Beach, Lower Summerland, on July 30. All four members of the investigating team were stationed at various points on the beachfront when, at 3:55 p.m., a most extraordinary occurrence took place. A large patch of white water materialized close to a headland at the southern end of the beach, drawing the attention of the BCCC observers. It was about 1,000 feet distant at this point, and it was clear that a large animal was swimming in a northerly direction against the prevailing wind and slight swell. 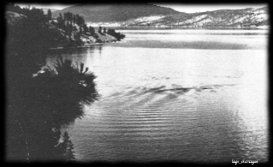 At a distance of about 600 feet, Kirk Sr. was able to see clearly through a Bushnell 40X telescope that this was the classic Ogopogo, with its humps well above the water level. Both Clarks were also able to see the object clearly through binoculars. The animal displayed, variously, five and sometimes six humps. "Kirk's telescope allowed him to see that the animal's skin was whalelike, and that there were what appeared to be random calcium-like deposits under the skin which appeared to be similar to barnacles in shape. All the team members agree that the animal was between 30 and 35 feet in length, and was almost 3 feet above the surface at its highest point -- that being the middle hump." 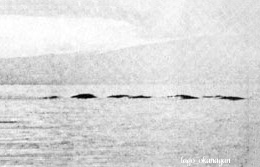 Kirk, John; "BCCC Report on Okanagan Lake, 1989," Cryptozoology, 8:75, 1989. From Science Frontiers #72, NOV-DEC 1990. © 1990-2000 William R. Corliss"
Atualmente, as organizações locais e até a Nippon Television Network Corporation se dispuseram em busca do Ogopogo.